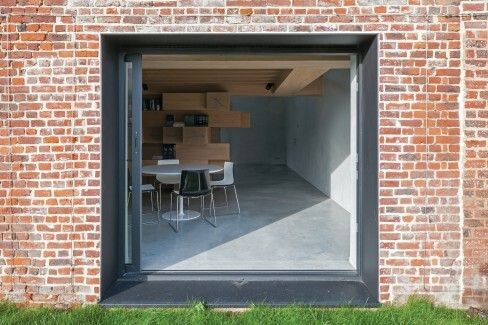 Belgium based Studio Farris Architects converted a small barn into an office space replete with a meeting room, library, workspaces, and a resting nook. The result is a beautiful cornucopia of green and open spaces. The staircase that leads up to the mezzanine where there is a smaller office set up. 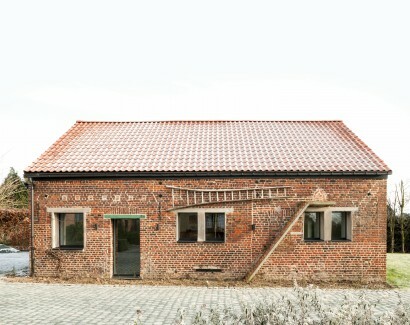 This easily reflects the principle behind the renovation and refurbishment of the barn by Studio Farris. 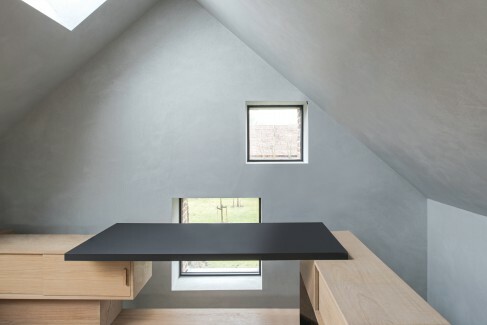 Studio Farris Architects, an Antwerp based practice, recalibrated (quite literally) a century old West Flanders stable, in Belgium, into an office space. The result is nothing like what you imagine when you think of a refurbished barn, which is actually a part of a larger farm complex. Speaking exclusively to Home Review, Architect Giuseppe Farris says, “The space is meant to put you in a different dimension when you’re working.”And we couldn’t agree more! Notice the drawers and cabinets nestled in the beams? It was all about keeping the space as uncluttered as possible, which also cleverly upped the green architectural quotient of the space. Before commencing with the revamping of the stable, Studio Farris decided to restore the building’s original façade. Since the stable dates back to the early 1900s, it housed many small rooms in its two-storey structure. Not razing the old structure fully to the ground and then start building was the first step towards lowering the carbon footprint of this project. First, Studio Farris took apart several of these rooms and then demolished the first floor alone. This was the first step towards giving this slightly fragmented space the perception of volume and more open spaces. With the abundant volume and space left behind without the first floor, there was now enough room for natural light, air, and beautiful views. “It was like being inside a chapel,” Farris says. This allows for maximum energy efficiency without any chemical reaction with the sulphates that may be present in the ground and in the walls. 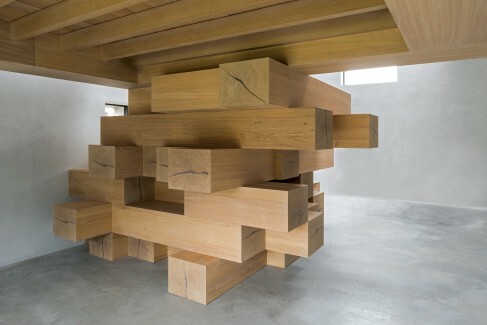 The result, of course, is a sprawling gallery-like space, into which the architects introduced a layered installation made from thick oak beams that are conjoined with steel profiles. This is our favourite structure and is an addition to the renovated office space. A few of the beams in this versatile installation work as cabinets and shelves to accommodate knick-knacks, artifacts, electronic devices, books, etc. Some of these even double up as reading and resting spaces. 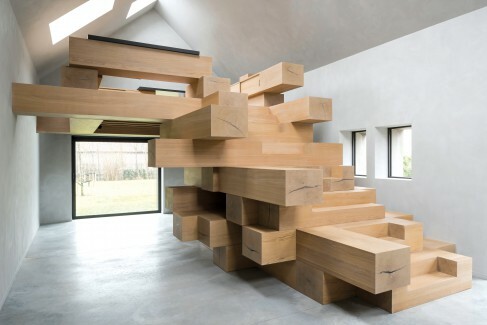 The remaining beams are solid and sturdy enough to bear load and come together to form a stairwell with a mezzanine that leads to the upper office. The sliding door right next to the meeting area that offers an immediate view of the surrounding landscape, and also diminishes the usual rigidity that comes with a normal meeting room setup. This ‘autonomous’ piece of furniture is “in response to the client’s functional requirements, and is positioned in such a way that it adds to the volume and dimension of the space without obstruction. 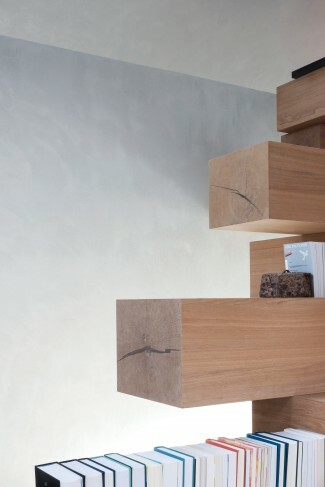 It also serves to provide the space with a variety of textures. With this installation, two additional work desks have been accommodated. The meeting area is nestled beneath the platform and comes replete with magnificent views of the external rural landscape. About this installation, Farris goes onto say, “We wanted to have enough space under the mezzanine to comfortably fit a table with chairs. Along with this, we also wanted to have enough space inside the room. For this purpose, we installed a sliding door at the other end of the room that opens out to the garden.” The comfort and ease with which one can navigate around this space is intrinsic with the original purpose of making the stable appear less like a workplace. With the adjacent garden, the office becomes more of a visual cornucopia of greens, thereby giving the owner a space that is breathable and sustainable on the whole. The look is organic and the intention of keeping it as frill free as possible renders the space sustainable. New openings were created from the mezzanine in order to allow sunlight to filter into the stable. The ‘pragmatic’ placement of these openings presents panoramic views of the surrounding landscapes. 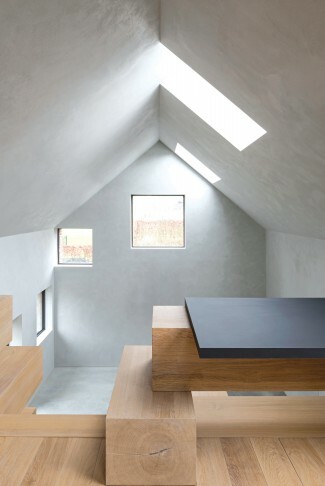 Along with these, several north-facing skylights have been installed overhead “in order to avoid overheating.” This is important considering the space is primarily a barn, and therefore the need for the temperature to be just right is paramount. This once again kept the use of energy for artificial cooling at bay. Makeshift work desk and a reading nook. The most interesting feature of the stable, however, is the ‘box-in-box’ feature. In order to make the unit more sustainable and environmentally viable, Studio Farris, while maintaining the outer brick façade, created one made of concrete on the inside. This box-in-box system is a simple, yet unique way to make sure none of the natural elements present in and around the stable are affected or damaged in due course. “By creating a new shell inside the existing façade we could improve the insulation and ventilation of the space,” Farris says about this interesting and quite out-of-the-box concept. Beams of timber stacked this way created multiple multipurpose nooks and shelves. “The challenge for us,” Farris says, “was to keep this feeling of the space while at the same time make sure we respond to all its functional needs.” What Studio Farris has done with this barn is create a space that makes good use of the abundant natural light and the surrounding lush landscapes without changing the external façade of the structure. The fact that this is primarily meant to be an office space may not even register immediately. 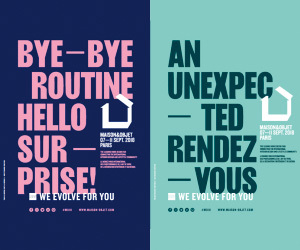 And that, we believe, for Studio Farris means – mission accomplished!